Apple is holding an event tomorrow, March 25th 2019. They have titled the event “It’s Show Time”. There has been some speculation as to what the event has in store. Here is what I think Apple will show off at the event. Last week Apple unveiled a new iPad Air, a new iPad mini, a new set of AirPods, and updated iMacs. So I think it will be very unlikely that there will be any hardware released at the event. Even with the unlikeliness of hardware, there is one piece of hardware that was announced but has yet to be released. That product is the AirPower Mat. If there is any hardware at all, it would be the AirPower Mat. I give the likelihood of this occurring at 1%. There is another possible piece of hardware that will be released, at least there has been some rumors of it. The supposed piece of hardware is an Apple TV stick. This would be an Apple TV that would fit into a device that would be approximately the size of large USB sticks. It is not that I do not think it Is technologically possible, quite the contrary, I think it is entirely possible. However, the power that is within the Apple TV 4K may not be able to be shrunken down enough to be able to handle the possible heat dissipation. If there were to be an event where this would be at this event. I give the possibility of this occurring at 20%. With hardware being announced last week I think there will be a heavy focus on services, specifically two subscription services. These subscription services will be a Magazine and Newspaper subscription, and the second will be a video subscription. Last March Apple announced their intent to acquire a magazine subscription service called Texture. It is very likely that Apple will unveil their version of the service. It is quite likely that this service will be part of the Apple News service. The Texture service, as it is now, allows you to pay $9.99 a month for a selection of magazines. There are 204 magazines that Texture subscribers have access to. I predict that the magazine subscription service will not charge all that much, but that it will add some newspapers to the subscription, in addition to magazines. I predict that the cost will continue to be $9.99 for both magazines and newspapers. I also predict that the standalone app on iOS will go away, but the Android versions will remain. I give the likelihood of the service being announced at 100%, the price remaining the same at 90%, the inclusion of newspapers at 80%, the iOS app going away at 50%, and the android versions remaining at 50%. Together, Winfrey and Apple will create original programs that embrace her incomparable ability to connect with audiences around the world. Winfrey’s projects will be released as part of a lineup of original content from Apple. This is a clear announcement that Apple was creating original content for a service. There are some additional hints as to how seriously Apple is taking the creation. First, they hired two former Sony Television executives. This is a huge indicator to the seriousness of the investment. So Apple is creating video content. Even if Apple had not announced it themselves, it is nearly impossible to keep production of tv shows, movies, and other content a secret. It is not the way Hollywood works. However, secrecy is one of Apple’s strong points, and what has been kept a secret is when it will be released as well as the pricing. This is where speculation comes in. I expect that an original content subscription will cost $12.99 per month. I expect this to include 4K content, where available, but it will only be streamable on the Apple TV 4K. I also expect that Apple will be selling subscriptions to services like ShowTime, HBO, CBS, and other services. When this happens, Apple will get a percentage of the sales. This makes sense because it would be a way of increasing services revenue. I give the likelihood of this happening at 85%. I predict that the Apple TV will see a slight interface refresh to accommodate the new subscription information. With the number of subscriptions going increasing, it is becoming an increasing problem keeping track of all of the Apple subscriptions that one can have. As of this writing there are two subscription plans available, iCloud storage and Apple Music, Apple Care+, and the iPhone payment plan. iCloud has been a monthly subscription since its release and Apple Music can either be monthly or yearly. Personally, I pay for Apple Music on a yearly basis because it is cheaper overall and it is one less monthly subscription. I suspect that Apple will have a bundle subscription of their own, for all of their services. This would include iCloud, Apple Music, the Magazine subscription, and the video subscription content. My guess is that this bundle will include 1TB of iCloud Storage, and it will cost $29.99 for everything. If you have 1TB of iCloud, that is $9.99, $9.99 for Apple Music, $9.99 for Magazines, and $12.99 for Videos, that comes to $42.96 for each one separately, so a bundle that costs $29.99 a month would be a savings of $12.97 a month, or effectively getting video content for free. If you subscribe to any of the premium channels, like HBO or Showtime, those would all be included in your monthly bundle price. Having a bundle would reduce the number of bills that come in and would add some predictability in how much everything will cost. I give the chance of a bundle of Apple services at 75%, with the cost being $29.99 at 50%. There is one last item that has been rumored. That rumor is that Apple is working on a gaming subscription service. While this seems completely plausible, I do not think that this will come at the March event. I think this will come with at the World Wide Developer Conference. This is because developers will likely need to be adjustments made by developers. The best place to explain the requirements to the developer community is at WWDC. It is still possible that it could be unveiled tomorrow. While not likely, it is still possible, so I give it a 25% chance of occurring at the event. I predict that there will be new release of iOS and macOS, specifically iOS 12.2 and macOS 14.4. These have been in beta, and I give the likelihood of the being released on Monday at 95%. There could be GM builds available for a couple days prior to actual release. Here is a recap of what I think will happen. Texture Android versions remaining – 50%. The March 25th event should be an interesting one. It is not likely to include hardware, but it will likely provide us with additional information about what services they plan to offer. I look forward to seeing what they have to offer. 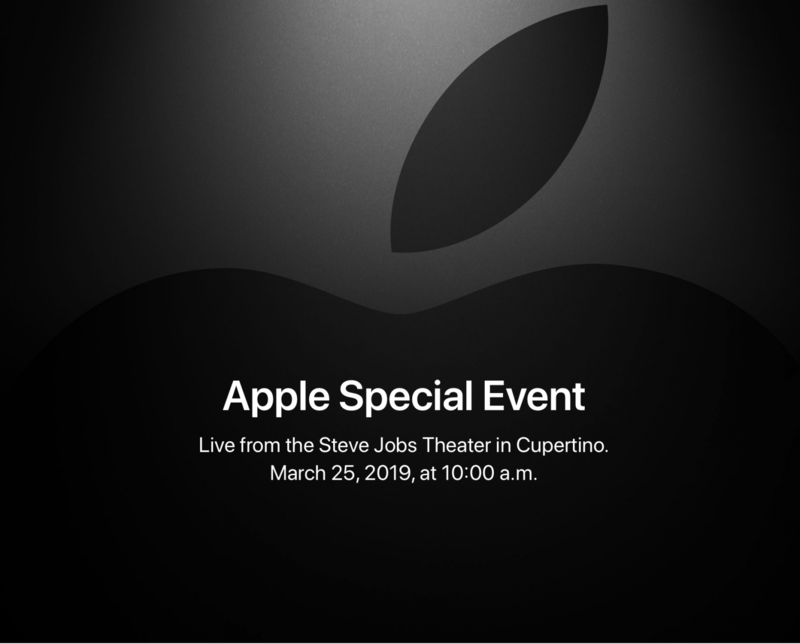 I will have a recap of what Apple announces after the event.